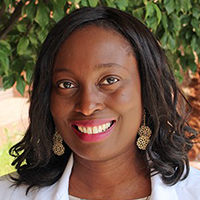 Dr. Coral Omene sees the effects of breast cancer on women every single day as a medical oncologist at Rutgers Cancer Institute of New Jersey and RWJBarnabas Health. She has dedicated her career, her research and her life to caring for patients, exploring new breast cancer therapies and seeing more survivors. She began her career in breast cancer care after receiving a combined MD/PhD degree at Columbia University College of Physicians and Surgeons, and afterwards obtained a PhD studying the interactions between the BRCA1 breast cancer gene and the protein BARD1 (BRCA1-associated RING domain protein), which was previously discovered in her laboratory, as a mechanism for defeating tumor growth. Throughout her experiences studying to become an oncologist, Omene has dedicated her life to researching new treatments and discoveries to the care of breast cancer patients, particularly those of an underserved population. Omene has made it her mission to help close disparity gaps when it comes to accessing breast cancer care to those who need it most in our 13-county service area, a goal Komen Central and South Jersey is dedicated to fulfilling. Recently, she has been working on a research project funded by the National Cancer Institute, aimed at reducing the risk of developing TNBC. This research has the potential to be used as chemoprevention (the use of medication to lower one’s risk of developing cancer), or to prevent cancer recurrence for TNBC patients and high-risk populations, once again helping to close the disparity gaps that exist in breast cancer care.